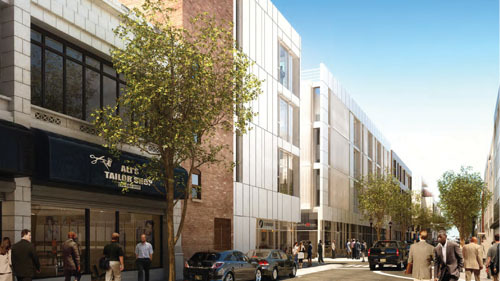 Halsey Street Teachers Village is a first-of-its-kind, catalytic redevelopment project within Downtown Newark. It brought together three charter schools, a daycare, residential units (pre-marketed to teachers), and an exciting array of retail establishments. The project utilized the energy created by the vibrant schools and teachers to establish a new community in the heart of downtown Newark. The City now has a new tool in the recruitment and retention of the best and the brightest to teach in Newark schools. The project is centrally located on Halsey Street and transformed 5 currently blighted city blocks into an active pedestrian community of diverse local and national retailers, modern apartment buildings, and new state-of-the-art space for the relocation and expansion of three local charter schools. Carver Federal Savings Bank participated in the Teachers Village development as a co-allocatee of New Markets Tax Credits. By combining its tax credits with NCIF’s, the bank was able to realize a large-scale, catalytic project effecting hundreds of community members in downtown Newark. The bank was also able to generate fee-based income from the transaction, supporting the sustainability of its mission and operations.